Thousands of commuters were put to great inconvenience as farmers from several nearby villages blocked traffic on the busy National Highway No. 8 at Pachgaon Chowk near Manesar in the district this afternoon. A large number of villagers today met SP Vivek Sharma in support of sarpanch Dharambir Malik, accused of killing a woman. They vouched for his innocence. Residents of Chandrawal, Bhirdana, Bothan, Hasanga, Jhalnia, Jandli Khurd, Jandli Kalan, Mochi and Chobara villages alleged that the case of murder registered against the sarpanch was false. 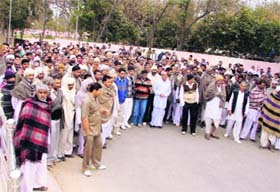 Villagers from Chandrawal and neighbouring villages outside the SP’s residence at Fatehabad on Sunday. The District Legal Service Authority (DSLA) has started a helpline to provide legal information free of cost. Chief Judicial Magistrate and Secretary, DSLA, Sandeep Singh, said this helpline would be available from 10 am to 5 pm and would be looked after by a team of local lawyers. The government is in a dilemma over the directive of the Punjab and Haryana High Court to demolish structures within a radius of 100 metres of the Air force Station here by March-end. The court has given these directions to Municipal Corporation of Faridabad (MCF) in response to a private interest litigation. The persistent rural sanitation efforts, made by the Haryana Government, has paid rich dividends. The state ranks third in rural sanitation in the country after Himachal Pradesh and Kerala, which occupy the first and second slots, respectively. Three persons were killed and 13 others injured when a pick-up carrying 18 Dera Sacha Sauda followers collided head-on with a canter carrying buffaloes near Dariyapur village here today. The deceased have been identified as Parkash Kaur (55), Pinki and Rai Singh. The district police claims to have busted a gang of robbers with the arrest of three culprits. It has seized pistols form their possession. It claimed that with their arrest it had solved a few cases of robberies that took place in the district over the past couple of months. The police has arrested Rajender Singh, medical practitioner at Guriani village, near Kosli, on the charge of doing medical practice on “invalid” registration certificates. Rajender Singh, a resident of Jhajjar district, has been running a private clinic at Guriani for the past several years. A 75-year-old woman was allegedly raped and murdered at Sawantkhera village near Dabwali here. Her body was recovered from the fields in the village. The incident took place when the woman had gone for a walk yesterday morning, but did not return till late in the evening. The villagers found her hands tied with her salwaar. The Punjabi community today sought better representation for their members in the state politics. The Multan Sabha, an organisation of Punjabis, who settled in the town after migrating from Multan district of Pakistan, organised its annual function in the auditorium of the CMK National PG College for Women here today. Haryana Governor Jagannath Pahadia has reshuffled the departments of three Chief Parliamentary Secretaries to assist the Chief Minister and ministers. Jaleb Khan has been attached with the Revenue Minister, the Mines and Geology Minister and the Animal Husbandry Minister. He will also assist the Chief Minister. The court of Additional District and Sessions Judge AK Shori here yesterday sentenced a person to four years of imprisonment and imposed a fine of Rs 5,000 after holding him guilty of attacking and causing injuries to the then Kaithal ADC, Ramesh Verma, in September 2008. An INLD leader, Baljit Singh Malik, and five members of his family were injured when they were allegedly attacked by a group of armed persons led by Ram Kumar of Murlana village at their residence in Gohana last evening. The farmers had assembled here to hold a mahapanchayat under the aegis of the Upjau Krishi Bhoomi Bachao Sangharsh Samiti to chalk out a strategy to prevent the acquisition of their fertile land for setting up an Industrial Model Township (IMT). Farmers of Mokalwas, Kharkhari, Bans Lambi, Kasan, Sehrawan, Kukrola, Kufarpur and Fazalas villages, who have been issued notices under Sections 4 and 6 of the Land Acquisition Act, have been opposing the government move to acquire their fertile land. The villagers had held a mahapanchayat over the same issue on January 30, during which Haryana Youth Congress president Chiranjeev Rao had assured them that he would convey their concerns to the Chief Minister and get the matter resolved. However, after waiting for about two weeks, the farmers again held a mahapanchayat here today. Some local leaders of the Opposition parties, including the INLD and the BJP, apart from Bharatiya Kisan Union (BKU) activists, also attended the mahapanchayat. Around noon, the panchayat leaders leading the protesters “summoned” the Gurgaon Deputy Commissioner to “appear” before the mahapanchayat within two hours, listen to their contention and clarify the administration’s stance (and offer) regarding the matter. A little later, they received the message that the Deputy Commissioner was away on leave and an SDM could be sent to them to receive their memorandum. The panchayat meeting continued for some more time, but then, the members decided to block the Delhi-Jaipur National Highway No. 8 alongside which the mahapanchayat was going on. The protesters soon blocked the highway, refused to talk to the SDM and demanded that either the Divisional Commissioner or the Additional Deputy Commissioner (ADC) be sent to accept their memorandum. aMeanwhile, an anti-riot squad of the police force was deployed at the blockade site as a preventive measure. 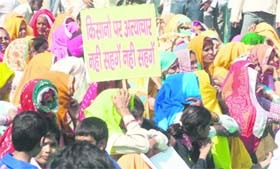 Ultimately, Gurgaon ADC VS Hooda and SDM Satender Duhan went to the farmers’ leaders and accepted their memorandum. They assured the protesters that their memorandum would be sent to the top state authorities and a meeting of their representatives fixed with the Deputy Commissioner. Following this, the blockade was lifted by the farmers. The police had booked Malik for the murder of Sonu on the complaint of her brother-in-law Anil Sharma. The latter alleged that the sarpanch had run his vehicle over his sister-in-law and father Jagdish Sharma as he nursed a grudge against them for not supporting him in the panchayat elections. Also, his relative, Mahabir, had sought information under the RTI that had ‘exposed’ the sarpanch’s role in a fraud. The villagers told the SP that Anil had falsely implicated Malik at the instance of Mahabir who ran a ration depot under the public distribution system which was closed by the Food and Supplies Department following complaints of irregularities by the sarpanch. The villagers also told the police officer that the case of alleged pension fraud had nothing to do with the death of Sonu. They said the FIR regarding the pension fraud case had been registered on the complaint of one Phool Singh, who was not related to Mahabir, Jagdish or Anil Sharma in any way. The SP said that he had asked DSP (Headquarters) Shamsher Singh Dahiya to conduct an inquiry. .He said the helpline, available on the phone number 01681-246989, would provide all legal information about any issue and anybody would be able to contact the helpline. He said while free service would be provided by a team of the advocates, call would be taken only between the stipulated time. This is the first such service started in the district. He said six lawyers had been deputed for the purpose. According to details, the lawyers in the team include Devender Singh Sheokand, Ishwar Singh, Jagdish Kumar Jagroop Singh and Mahavir Tanwar. He said two lawyers would be attending calls on a daily basis and the work had been divided into two shifts. A local lawyer said this would help the residents get proper information about their queries and they would not be wasting their time enquiring about an issue in the offices of the district administration and the local judicial complex. The clients would also be saved from getting duped or misguided by vested interests, especially regarding legal services or help on various matters without getting into legal hassles. These unauthorised structures pose a security threat because of their proximity to an ammunition depot of the Air Force. More than 20,000 houses and small industrial units spread over at least six densely populated colonies will be affected by the court order. Illegal buildings began coming up in the prohibited zone more than two decades ago with both the civil authorities and the high-ups at the Air Force Station looking the other way. If residents are to be believed, a senior personnel posted at the Air Force Station bought a big chunk of private land, carved out plots and sold these to private parties. A good number of retired IAF personnel are among those to have constucted houses in the area, Chaudhary Bachchu Singh being one of them. He claimed than an officer who once headed the Air Force Station had sold a number of plots to personnel of the department. So blatant are the violations that some shops and houses have come up right at the main entrance of the defence establishment. Also, there have been encroachments on the 60-metre road that connects the Air Force Station to the city roads. The residents, who took to the streets on February 6, have constituted a sangharsh samiti to counter the move of the authorities to demolish their structures. Jagtar Singh Virdhi, who set up a factory in the area after migrating from Ludhiana, said the residents of the affected colonies-Kapra Colony, parts of Jawahar Colony and Dabua Colony, Nangala Colony, Oriya Colony and Gajipur Colony- had decided to wage a legal battle. Some of them would appeal to the Supreme Court against the orders of the High Court. Virdhi said most residents had sold their properties to set up home and find a livelihood for themselves here. He said they must be compensated for being uprooted. Minister Shivcharan Lal, who represents the NIT (Faridabad) constituency, says he has taken up the matter with the Chief Minister. He said a way out would soon be found. This was stated by the Chief Secretary, Urvashi Gulati, while presiding over a meeting of the state-level selection committee held here recently for finalising the state-level awards under the Mukhyamantri Sanitation Incentive Puraskar Yojna for 2010-11. The village gram panchayats, which have been selected for the awards, include Madhubans of Yamunanagar district under category A, with a population of 1500, village Bado Brahmanan of Hisar district under Category B having a population from 1,501 to 4000, and village Mehlawali of Yamunangar district under category C, with a population of over 4,000. The villages, which bagged the awards, would be given cash prizes of Rs 3 lakh, Rs 5 lakh and Rs 7 lakh, respectively. The Chief Secretary said the gram panchayats had been selected for awards at three levels--block, district and state--through a defined process, and in all, 444 awards have been given. Explaining the selection process, Gulati said in the first stage, block-level selection committee selected gram panchayats for block-level awards based on given indicators like well-maintained schools, anaganwaris, other public buildings, ponds and community toilets, proper collection and disposal of wastes, both liquid and solid etc. Third-party verification for independent assessment of these block-level award winning gram panchayats was carried out for selection for the district and state-level awards. District-level selection committees, in turn, select gram panchayats for district-level awards on the basis of the score obtained during third-party verification. Finally, state-level selection committee selects gram panchayats for state-level awards on the basis of the third-party verification report, and recommendations of respective district-level selection committees. The Centre for Rural Research and Industrial Development (CRRID), Chandigarh, had undertaken the task of verification for selection of grampPanchayats for district and state-level awards. Gulati said sustainability awards would also be given to 13 villages on the basis of verification report of the CRRID. The villages were situated in the districts of Ambala, Bhiwani, Faridabad, Gurgaon, Jhajjar, Karnal, Kurukshetra, Mewat, Panipat, Rohtak, Sirsa, Sonipat and Yamunangar. Out of these villages, Lowa Khurd falling in Jhajjar district had topped the list of sustainability awardees followed by Nautaki of Mewat and Jattal (Panipat) and Marodi Jattan (Rohtak), each with 71 points. As many as 61 villages were in the race for the sustainability award. Yamunanagar, Sonipat, Hisar and Sirsa were the top performing districts and improvement had also been made by Panchkula district. The Chief Secretary lauded the efforts of the Rural Department for efficient sanitation drive. As many as 259 villages had bagged the Niraml Gram Puraskar. She said the efforts of the Education and Health Departments were equally laudable in this regard. The incident took place when the victims were returning to Sirsa after attending a congregation addressed by dera chief Gurmeet Ram Rahim Singh in Hisar today. SP Vivek Sharma said the accident took place as the right wheel of the truck came out suddenly. Passersby informed the police, which rushed to the spot for rescue operations. While Parkash Kaur died on the spot, two of the four injured rushed to Hisar in a critical condition died on the way and were declared brought dead at the hospital. Jaspal Singh, Gurbachan Kaur, Shanti, Kanta, Pritam Kaur, Gurjit Kaur, Raj Rani, Suman and Sumitra, all dera followers, were among those injured. Cattle traders Balwant Singh and Darshan Singh, who were travelling in the canter, were also injured. Civil surgeon OP Arya said seriously injured Parvati and Shanti had been admitted to Sarvodaya Hospital in Hisar in view of their critical condition. He said he had spoken to the civil surgeon, Hisar, to arrange for their treatment, as private doctors were reportedly on strike there. District police chief Pankaj Nain said those arrested were Rakesh, son of Amarnath and resident of Bibipur village; Sunil, son of Kartar and resident of Babel village; and Amarjit, son of Lakhim Chand and resident of Shekhupura village. The SP said the police had seized three pistols from their possession along with some bullets. He said all the three accused were arrested from different places. The gang was involved in many robbery incidents and used pistols to terrorise and loot unsuspecting people. KarnaL: The police has arrested two persons allegedly involved in a number of thefts and recovered stolen property worth Rs 4 lakh from their possession. The accused had entered a house in Sector 4 to commit theft and also administered some intoxicant to women present inside the house. ASI Romesh Chand said the arrested had been identified as Tara Chand and Pushpi, alias Raju, of Tarawadi. The arrested have confessed to their involvement in eight cases of theft and one case of chain snatching. The police recovered gold and silver ornaments worth Rs 4 lakh and gas cylinders from their possession. The police has arrested Rajender Singh, medical practitioner at Guriani village, near Kosli, on the charge of doing medical practice on “invalid” registration certificates. Rajender Singh, a resident of Jhajjar district, has been running a private clinic at Guriani for the past several years. He was yesterday produced in the court of SDJM PK Lal at Kosli, who remanded him in 14-day judicial custody. Police sources said when Dr Ramphal Yadav, ayurvedic therapy officer of Government Ayurvedic Dispensary, Sangwari, conducted a raid on Rajender Singh’s clinic at Guriani on Saturday, his registration certificate of Government Ayurvedic and Unani Medical Council, Patna (Bihar), as well as the registration certificate of the Board of Ayurvedic and Allopathic Practitioners, Delhi, were found inadmissible and hence non-permissible for medical practice. The police has registered a case under Sections 302 and 376 of the IPC, but the SHO said the matter was being investigated from all angles. The woman was living with his brother’s family in the village. She was married in Khudian village of Muktsar district in Punjab and her husband had died some time back. Congress MLA from Rohtak Bharat Bhushan Batra lauded the role of the Punjabi community in nation building and in the growth of society in the state. He said those who migrated from Pakistan after partition worked hard to carve a niche for themselves in the society and in the process they helped in building a strong nation. He, however, regretted that the community did not enjoy the participation in politics it truly deserved. He suggested that instead of blaming others for disproportionate representation in politics, the members of the Punjabi community should exhibit unity, so that those at the helm were forced to give them their due. Punjabi folk singer Surinder Chhinda moved people’s sentiments with his touching songs on female foeticide. The sabha honoured meritorious students and other achievers of the community. Prahlad Singh Gillankhera has been attached with the Public Works Minister, the Sports and Youth Affairs Minister and the Forest Minister. Zile Ram Chochra has been attached with the Public Health Engineering Minister and the Industrial Training Minister. He will also assist the Chief Minister. The court of Additional District and Sessions Judge AK Shori here yesterday sentenced a person to four years of imprisonment and imposed a fine of Rs 5,000 after holding him guilty of attacking and causing injuries to the then Kaithal ADC, Ramesh Verma, in September 2008. However, five others were acquitted by the court due to lack of evidence. The injured were taken to the Civil Hospital where the doctors referred them to the PGIMS, Rohtak. The police has registered a case. Personal enmity was suspected to be the reason behind the attack. In his complaint, Malik alleged that the accused had taken away his gun and cash.